The Smart-Fit Ferrule; doesn't stick! If it doesn't mesh with the cup, it twists. If it twists, it wears out. If it wears out, it leans. And if it leans, it shows. 16 tapered flanges seat the ferrule and flagstick perfectly with the Smart-Fit Cup...EVERY TIME. Comes standard on all Standard Golf Company Flagsticks. Note how precision-formed flanges on the SMART-FIT ferrule are designed to mesh perfectly with sturdy gusset reinforced ribs on the ST 2000 cup. 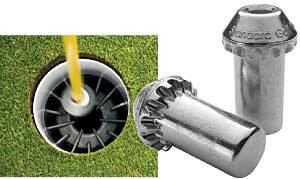 (1) This allows the flagstick to seat with the cup EVERY TIME. (2) It prevents the ferruel from twisting inside the cup. (Less twisting means less wear-and-tear on both the ferrule and cup. And fewer flagsticks flying in windy conditions.) AND IT DOESN'T STICK Dirt and sand easily sift through to minimize sand and grit buildup.